Quilpie, the administrative centre of Quilpie shire, is about 860 km west of Brisbane and 320 km from the South Australian border. It is thought that the name was derived from an Aboriginal word describing the stone curlew. Pastoral occupation in the Quilpie region began in the early 1860s: Thargomindah station and Bulloo Downs, south of Quilpie, and Kyabra, west of Quilpie, in 1867. A teamsters' camp evolved on the Bulloo River, and a town was surveyed there two years before the arrival of the railway extension from Charleville in 1917. The site eventually settled on was a ridge on the western flood plain of the Bulloo, which provided proof against flooding. Quilpie became a railhead for the western wool industry. A school was opened in 1918 and a hospital was built in 1922. Given its remoteness, a self-reliant town developed, with shopkeepers, blacksmith, well borer and local builder. The loss of much of the commercial area by fire in 1926 left the town with no alternative but to rebuild. In 1933 bore water was successfully drilled, leading to a reticulated town supply (1933) and a wool scouring works. The scour was closed in 1951 when the unprecedented high price for greasy wool made local scouring economically unimportant. Quilpie was a service centre for the wool industry and supply centre for the region. Bullock teams drew wool wagons until the 1930s when they were displaced by motor lorries. The shire council was able to provide limited facilities until the 1950s when high wool incomes enabled town facilities to be built: a shire hall (1955), a swimming pool (1967) and local initiative established bowling and golf clubs. Local government predated the Quilpie township, beginning as the Adavale division (see separate entry). Adavale, 90 km north of Quilpie, was the centre of a pastoral and opal-mining district and remained the shire's administrative centre until the 1920s. By 1930, the absence of a railway connection had reduced its population to about 150, and Quilpie's was about 500. 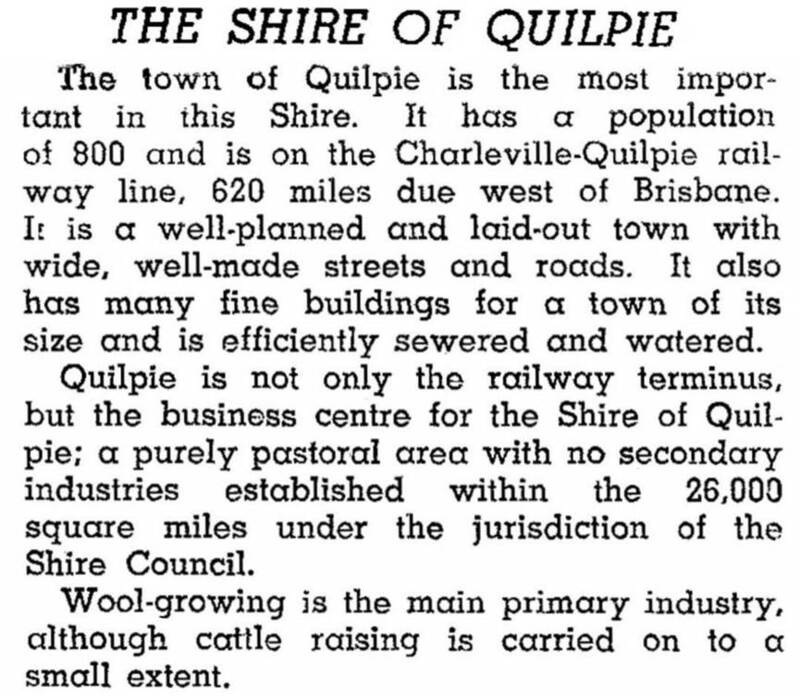 The shire was renamed Quilpie in that year. With an area of 67,482 sq km, Quilpie Shire contains large sheep and cattle grazing enterprises. Opal mining is mostly confined to fossicking, but oil and gas production at the Eromanga basin west of Quilpie contributes significant volumes to the Moomba distribution centre in South Australia (1993) and the Brisbane gas market (1996). In 1994 gas from the Adavale basin was also linked by pipeline to the network. The first oil/gas well tapping the Cooper/Eromanga basins occurred in 1964. Adavale's chief commercial outlet is its hotel. Eromanga has its Royal Hotel (1885), a motel, a caravan park, a hall and a primary school. Quilpie, with over half the shire's population, is a significant business centre. It has an aerodrome, hospital, Catholic primary school (1950), a state primary and secondary school and a hostel for the secondary students. There are also Anglican and Catholic churches, a golf course, swimming pool, two motels and a museum and information centre.